The news that China is building a so-called “super-missile” is the latest in a string of developments with the potential to tilt the strategic balance in Asia. Local media in China have cast doubt on foreign claims that the PLA recently test-fired its DF-41 intercontinental ballistic missile – though there is general acceptance that the program exists, and has done so for a long time. Whatever its development status, the long-range ICBM is believed to be road-mobile, and hence difficult to locate and pre-emptively destroy. The missile would be capable of travelling half way round the planet and then striking numerous targets, courtesy of a technology called multiple independent re-entry vehicles (MIRVs) designed to defeat missile defense systems. Meanwhile, missile defense is the flavor of the month in many of the countries that view China with unease. These systems are never explicitly built with China in mind. Upgrades for Japan’s missile defense system, according to the U.S., are all about the threat from North Korea and not about countering China. Nonetheless, Beijing senses, no doubt correctly, that a proposed Asia-wide missile defense shield, while effective in terms of nullifying Pyongyang, would also be built with China in mind. Meanwhile, it also came to light this month that the U.S. is looking at helping India improve its nascent missile defense system. The Indians are confident that their domestically developed system works, but there is no doubt that they would have much to gain from U.S. assistance if they hope to build a multi-layered missile defense network. Again, the acknowledged threat is not so much China – rather Pakistan is the source of the missiles that New Delhi is officially worried about. Yet China looms ever larger in India’s defense outlook. 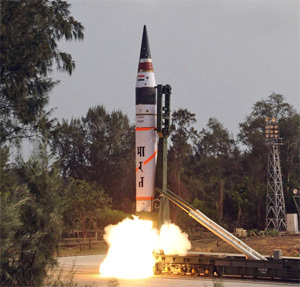 When India test-fired its Agni-V intermediate range ballistic missile earlier this year, it was the system’s ability to strike anywhere in China that saw it lionized in the Indian press. Naturally, China is developing its own missile defense system to counter the missile arsenals of India and others. It also would be unsurprising if this system were to make its way into the inventory of Pakistan, one of China’s closest Asian allies, to help Islamabad match India’s BMD capability. At the same time, Pakistan is reported to be developing maneuverable re-entry vehicles to help it to maintain a credible strategic deterrent in the face of Indian countermeasures. There may or may not be an arms race in Asia, depending on your view of what an arms race involves. But in the realm of ballistic missiles and ballistic missile defense it is hard not to conclude that a race is being run. Too many countries are boosting their missile and/or their missile defense capabilities for it to be otherwise. This is not necessarily a cause for concern: countries inevitably balance against one another’s new capabilities, and every advance in one nation is cancelled out by a similar advance in another. The danger is that these all developments proceed at different paces, leaving some countries out in front and others left feeling strategically vulnerable. Indeed, some analysts have already voiced concerns that China’s missile forces are becoming “too strong to contain,” at least in some areas. China, too, won’t want to make its neighbors feel more vulnerable than they already do. Don’t expect too many more disclosures about Chinese ballistic missiles or missile defense systems over the next few months. Pakistan’s test-firing of the Hatf 9 missile was likely conducted with India in mind. It will only increase instability. Pakistan’s Misguided Nuclear SignWhat Putin's Exotic New Nuclear Delivery Methods Are Really AboutHawaii's Missile False Alarm Spurs Worries About US-North Korea WarDon't Be Too Sure About a Stalemated US-China Military BalanceAre the United States and China Condemned to a Military Stalemate?